I like things a bit retro in the book department. I love the feeling of a crisp, new book instead of an e-reader. I love to read in bed with a small dim light, and wake up with the book still in my hands and my last page dog-eared. I love getting books as presents and I love giving books as presents. I love spending hours in a book store just meandering around waiting for a special book to jump off the shelf and into my arms and then rushing home to start reading it. When I read, I read for long periods of time. It is not uncommon for me to sit down and read for hours and hours and finish a book in one day. There is something magical about books. They transport you to another era, a different life. They teach you about life, and people, and things. When I moved to Manitoba I really didn’t know much about the province. One way for me to get to know my new province was through books. I started searching for books that centred around Manitoba. Over the last five years I have found quite a few Manitoba themed books that I have really enjoyed. I also have a Manitoba book wish list, books that I have not yet read but I will read in the near future. Seeing as it is the Christmas season and many of my readers also live in Manitoba I thought you might enjoy my Manitoba book list. Perhaps they would make a nice present for a Manitoban in your life? Or perhaps they will peek your interest and you can request one of these books from Santa. I Am Hutterite by Mary-Ann Kirkby. I borrowed this book from a friend after moving to South Western Manitoba. I knew nothing about the Hutterite lifestyle although I was living in an area with many Hutterite colonies and I was curious. This book is an interesting look at one woman’s life that began on a Manitoba Hutterite Colony and her experiences after leaving a Hutterite colony. For more information on this book click here. 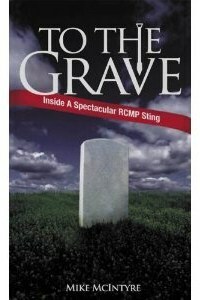 To The Grave: Inside A Spectacular RCMP Sting by Mike McIntyre. I borrowed this book from a friend as I heard it was a very interesting read and about the South Western Manitoba case involving the mysterious disappearance of Erin Chorney. The details in the book jump right off the page, and paint vivid, yet disturbing portraits. This would be a great read for anyone that likes true crime stories. For more information on this book click here. Manitoba Book of Everything by Christine Hanlon, Barbara Edie, and Doreen Pendgracs. This is one of the first Manitoba books I purchased after moving to Manitoba. This is a fun, great overview of everything that is Manitoban. It covers a wide variety of Manitoba topics and themes. It is a fun, quick read and a must have for anyone that loves Manitoba. For more information on this book click here. 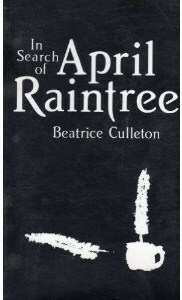 In Search Of April Raintree by Beatrice Culleton. A couple years ago I was assisting a high school English class and this book was part of the class’s reading requirements. I initially read the book to be able to better assist the students, but I immediately fell in love with the story and writing. It is a glimpse into the world of a young Metis woman in Manitoba. The story will pull on your heartstrings and open your eyes. For more information on this book click here. A Daytripper’s Guide To Manitoba by Bartley Kives. I have mentioned this book previously on my blog but it is so good it deserves to be mentioned again. It is by far the best overview for exploring this great province. I highly recommend it to anyone who wants to explore all the nooks and crannies this vast province has to offer. For more information on this book click here. 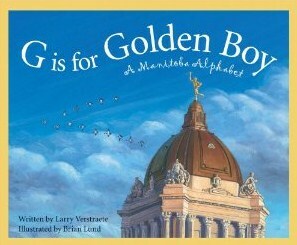 G Is For Golden Boy: A Manitoba Alphabet by Larry Verstraete. This is a great children’s book highlighting Manitoba. Definitely suitable for introducing Manitoba pride to children and adults alike. For more information on this book click here. Manitoba Birds by Andy Bezener and Ken De Smet. I use this book often. Most of the time it sits on a table below my window where I watch birds at my feeders. It was a present from a friend and I have mentioned this book previously on my blog. It is a great quick reference book to identify birds all over the province. A perfect stocking stuffer for any Manitoban who loves birds. For more information on this book click here. 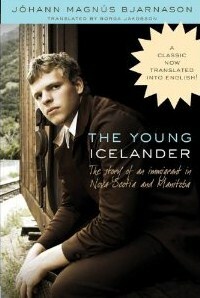 The Young Icelander: The Story Of An Immigrant In Nova Scotia And Manitoba by Johan Magnus Bjarnason. I have not yet read this book, but it is on my wish list. It appeals to me as it involves my two favourite provinces, Nova Scotia and Manitoba, and it offers a glimpse into the history and experiences of immigrants over 100 years ago. For more information on this book click here. Ghost Stories Of Manitoba by Barbara Smith. I have not yet read this book, but it is on my wish list. I think it could be a fun, yet scary, quick read offering insight to various haunted locations across the province. For more information on this book click here. Made In Manitoba: Best Of The Open Road Stories by Bill Redekop. I have not yet read this book but it is on my wish list. It appeals to me as it focuses on experiences of a rural reporter for the Winnipeg Free Press and highlights his columns about his explorations and rural Manitoba travels. For more information on this book click here. 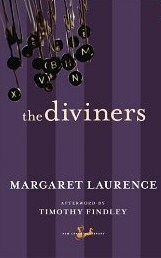 The Diviners by Margaret Laurence. Margaret Laurence is one of Canada’s most famous authors and was born in Neepawa, Manitoba. Many people (including me) were first introduced to her writing through her popular book The Stone Angel, as it was required reading in my high school English class. I have not yet read The Diviners but understand it is a great book that takes place in a fictional Manitoba town that some believe is based on Neepawa. For more information on this book click here. Bathroom Book Of Manitoba Triva: Weird, Wacky And Wild by Lisa Wojna. This looks like a fun, quick read filled with interesting Manitoba facts. 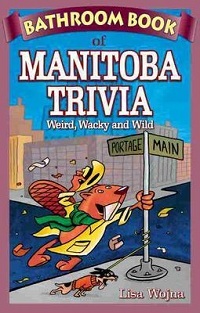 I would love to receive this book as a present, and then amaze all my family and friends with the Manitoba trivia. For more information on this book click here. Mary’s Atlas: Mary Meets Manitoba by Gwen Smid. A friend of mine owns this book and says it is fun read for her children and that they love the book. She recommends it to anyone with children in Manitoba. For more information on this book click here. Do you have any favourite Manitoba themed books? Are there any Manitoba books on your Christmas wish list? Check out Winnipeg O' My Heart's blog post about her favourite Manitoba inspired books! Click here to read her blog post in response to mine. Even more fantastic Manitoba book ideas! Thank you Winnipeg O' My Heart for sharing. Please share your favourites too!